For me, journaling often begins with an image. A drawing a day, changes my life. Widens perception. It just takes a few minutes. The drawing above was from 3 months ago, a complete surprise as it drew itself. My journaling from it was juicy, fresh and unexpected. This is my drawing from this morning. I use Prisma colored pencils, take less than 5 minutes to draw my image, then date and title it. Afterwards, I let it speak though my journal, usually starting with ” I am _____.” On the left is a 3-ring binder I put my drawings in. Draw first, then write. It only takes a few minutes and will widen your window of the world. Exercise your creative muscles everyday! Wow, life changes fast. My new business cards arrived in the mail yesterday and now they are already obsolete . My business name has reinvented itself to Change Doctor and I have registered the trademark. 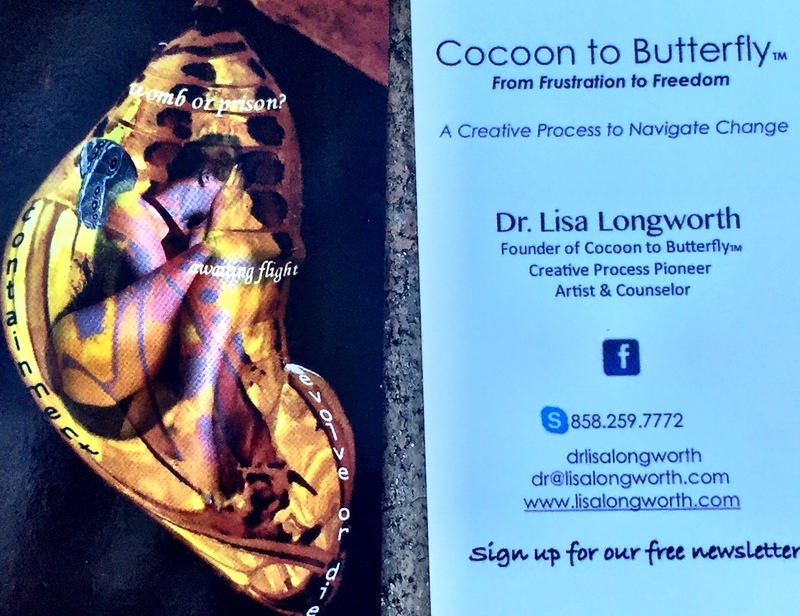 I am out of the cocoon that I thought was a butterfly…. So I made lemonade from the lemons. 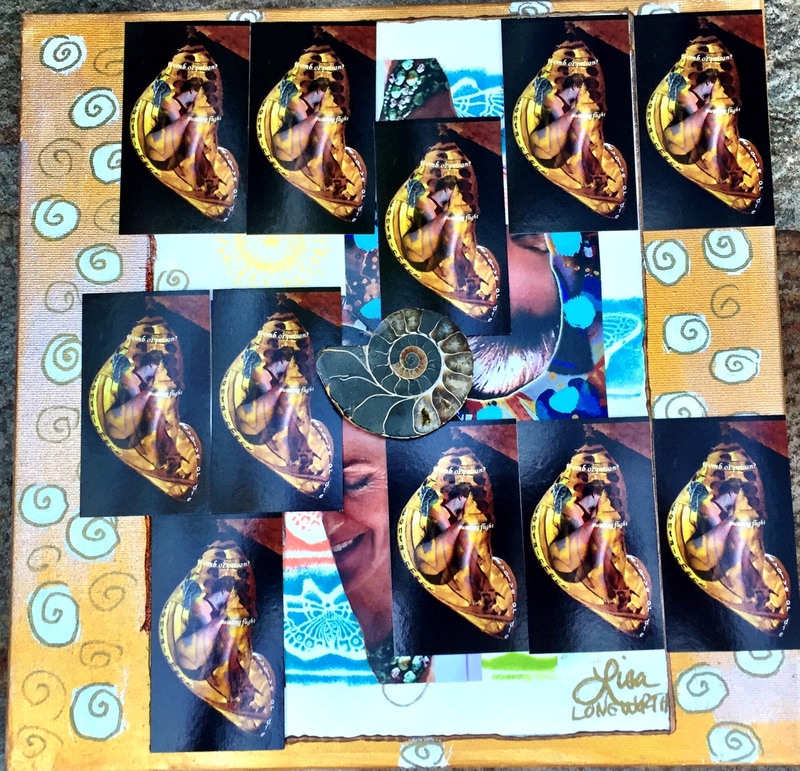 Reinventing one of my old canvas’s ( 12″ by 12″) with 11 of my “old skin”business cards, I added a nautilus shell in the center. Loving Life! In the 80’s, we envisioned a new creative healthy world. Now it’s happening. Evidence at the San Francisco Airport this weekend. A Yoga Room! 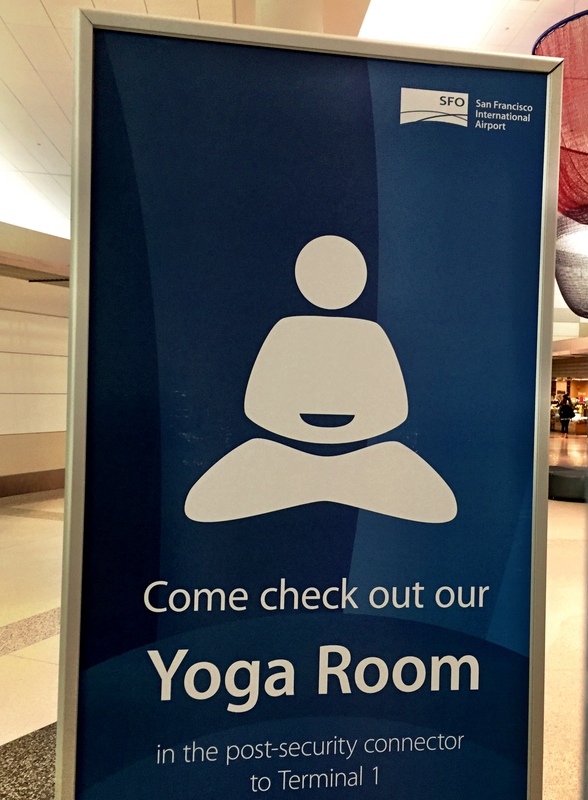 How about a Creativity Room in every airport by 2025. What are your ideas to help this unfold? Creativity transforms. I’m not just saying that. It has helped me through hundreds of mini and many large transitions. Creativity has been my medicine story since I was a little girl. The first memory I have of creativity facilitating change for me was after the death of my father. I was ten. He and my mother were divorced. He lived in California, we lived in Michigan. One day, she returned home from work to tell my sister and I that my father was dead. He had died in prison from a heart attack. This was a huge shock. Not just the part about him being dead. But the part about prison too. They’d kept it secret from us to protect us. I was in shock. I didn’t want to talk or be held or cry. I went to the piano and played for hours. I played until my fingers hurt more than my heart and my body had merged with creativity. I was able to journey to a healing place through music that my mind couldn’t journey to alone. Not long after this, I received the part of Little Orphan Annie in the local amateur theater. I’d auditioned a couple weeks before Dad died. I spent months acting out a child’s longing to find her dead parents and her adoption by Daddy Warbucks on stage. Creativity was made mythic. By summer, I didn’t exactly forget that my dad was dead, but my heart was healed in non-verbal ways through the experience of performing a child’s mythic story on stage for weeks. Fast forward to the future. Transitions aren’t always easy for me. Sometimes, during transitions I’m messy and feel young, scared and insecure. Sometimes I act out old stories unconsciously, especially with my partner, when we both go through a challenging transition. I act out my inner demons with him unconsciously and it is messy and harmful to us both. And then I remember. Write a poem. Paint a picture. Dance. Act out the beast consciously. So I go to the ocean and dance my grief, fear or anger. I go outside and stomp on the earth dancing a chaos dance. I write the words that I need to express, not in the ‘hear is the story of my stuckness and blah blah blah let’s talk talk talk our conflict out in circles’ but rather, I translate the feeling into a mythopoetic storypoem. Alone. So I can find myself and my center. And I get quiet. I listen to the story reverberate its medicine back at me. That’s when creativity is mythic and transformative in the same breath. When I cease being the creator and am witnessing the act of creation echoing its medicine and reflection back at me so that I can receive its wisdom through my feeling body. I get out of my mind’s stuck perceptions and ways of seeing because of this. I change because of this. I can forgive, or move forward, or take courageous little actions because of this. I can see where I was, in a more transcendent, mythic map and get out of the small stuck story. It is dynamic, real, and the truest thing I have ever known. I make sure to keep it in my body –to embody it –because to simply fly with creativity isn’t always a medicinal thing; it can be an escape. 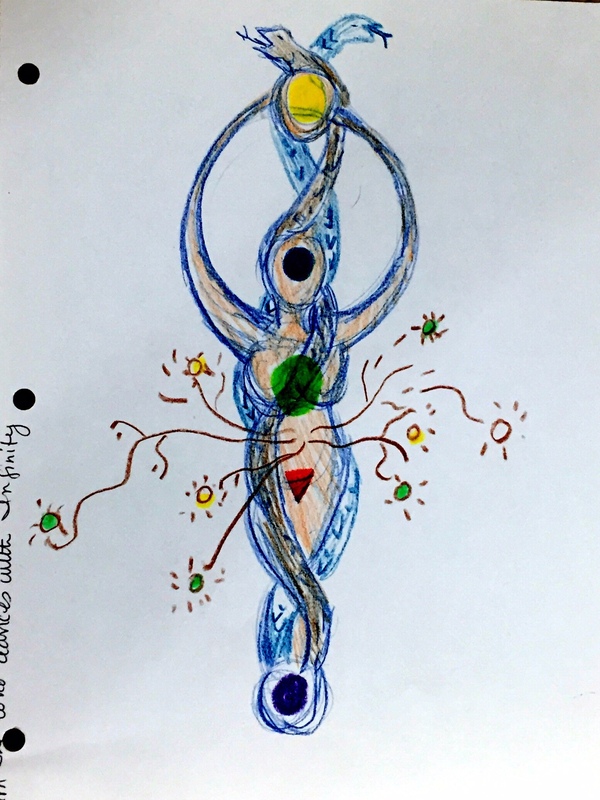 But to place creativity in a somatic and expressive context… to dance the words until they rewire my cells… that’s a miracle. It’s magic. Be published next 2013 newsletter! I invite you to write back to me about your deeper journey and how you changed or transitioned in 2012 (and entering 2013). How did the butterfly of your own becoming emerge? How were you able to listen to your deepest self and navigate the change? 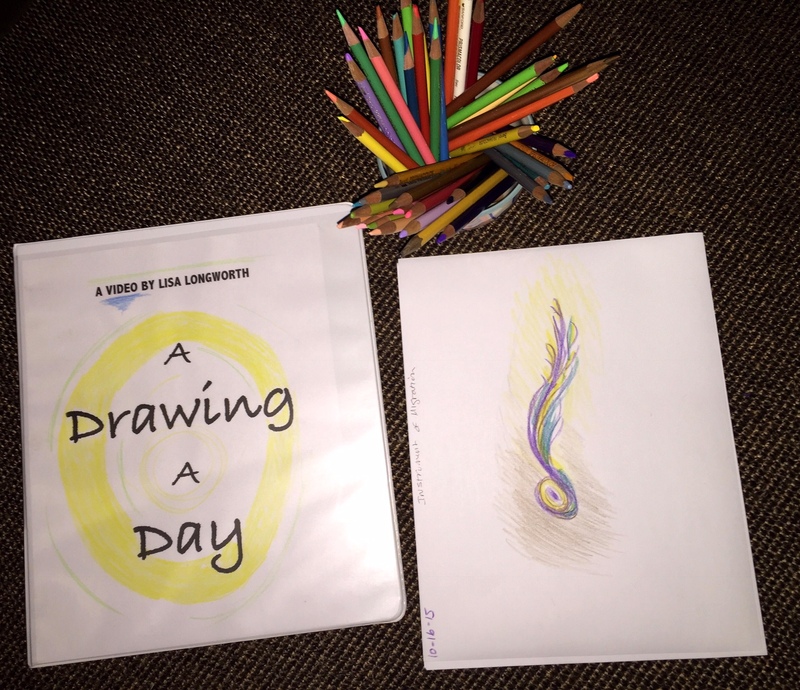 How did you experience the creative process, ignite your passion, deepen relationships or live the authentic life? Think following your intuition, creativity, purpose and soul’s journey. Think journaling, mind-mapping, treasure maps (magazine collage),nature time, yoga and movement, meditation, animal connections, time with mentors, favorite quiet and sacred places. Inspire others through your story! Short and sweet stories of one or two paragraphs are best (300 words maximum) Please send your story by clicking comment below. Transition Secrets - Fresh Places More coming soon. Enter your email address to subscribe to Dr. Lisa's Inspiration and receive notifications of new posts by email.